poems, paintings, drawings, & somber memoirs of a distant/painful war. Mahmoud Darwish passed away this weekend, and with him passes a grand epoch of our collective existence. For many of us, his poetry embodied our life struggle, our populist dreams and our humanist expressions, and the struggles and dreams and expressions of our mothers and fathers. His writing will remain a testament to his artistry and vision, and will always light the path so long as the struggle for freedom continues. With an inspired voice unparalleled by anyone in the realm of modern Arabic literature, Darwish uttered eloquent ballads of Heaven and Earth. With words, he painted lavish murals depicting the struggle between the heroism of the meek and the futile brutality of the faceless tyrant. With an eloquence reminiscent of sages and prophets, he spoke revelations of man's grappling with his own humanity, with his tragedy and his memory. His poems stood on the virtues of a humble commonness, a melancholy beseeching for love and truth, and a fervent honorable struggle for dignity and freedom. Mahmoud Darwish's poetry inspired millions of my generation, and many more millions of my parents' generation, to a deep, emotional understanding and appreciation of our own humanity, with all its contradictions, through the lens of the Palestinian and Arab struggles. Many of my friends and artist-contemporaries who grew up as exiles, be they Palestinians, Lebanese or other Arabs, became artists, writers and filmmakers and nourished from the roots of the Palestinian, Arab and African-American struggles, and were inspired by such giants of Arts & Letters as Mahmoud Darwish, Naji El-Ali, Marcel Khalife, Malcolm X, Sheikh Imam, Frantz Fanon, Edward Said, and others. In addition to all the shortcomings that will be found in Western obituaries about Darwish, perhaps the greatest bias perpetrated against him was his continued exclusion from the Nobel Prize for Literature, which many favored him to receive in recent years. The Nobel committee chose instead a token Arab for a once and only time granting of the prize to an Arab, giving Naguib Mahfouz the prize in 1988. No comparison there, but the reasons become clear when one considers the subject matter of Mahfouz, more palatable to mainstream Western political persuasions, and when one also considers that the mere utterance of the word Palestinian, let alone Palestine, in the West, in any way that gives recognition, is almost unfathomable. 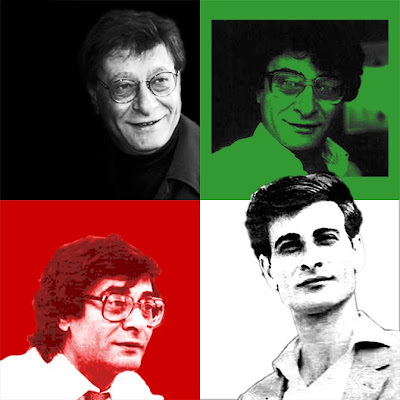 Mahmoud Darwish's death makes us sad today, but he will not be missed, for he left us with a resplendent and revered volume of poetry that will inspire us for generations to come, and his characteristically Palestinian nostalgia for freedom will also manifest itself in generations to come. LISTEN to Mahmoud Darwish's voice in recitation of his own poetry. If you are a zionist or zionist sympathizer, you are not welcome to contribute comments that allow you to propagate your deceitful position in any effectual way on this blog. If it is along the lines of the forked-tongue savagery propaganda of that monster Golda Meir, who said: "we will never forgive the Palestinians for making us kill them", your comment will be deleted. Deena Jouni wrote an article about us for As-Safir (Daily Arabic Newspaper in Beirut.) >>>CLICK TO READ IT!